This analysis is done by Geomancy.Net using a combination of Chinese Astrology (Zi Wei Dou Shu) with Ba Zi Analysis. NOTE: This is done using only 12 Earthly Branch / Animal Signs, so it gives you a general analysis of each Animal sign. It will not be as accurate as a Professional Ba Zi analysis. As each Year such as those born in the Rat Year has further 10 divisions (ie. weak/strong water Rat, weak/strong Wood Rat, weak/strong Fire Rat, weak/strong Earth Rat, weak/strong Metal etc). So depending on what kind of element you are, your luck will change accordingly. 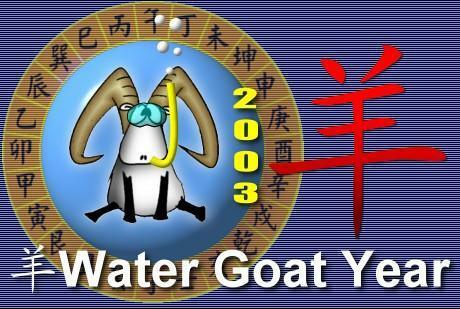 2003 is the Year of Goat, where the Heavenly Stem of the Year is Water while Earthly branch is Earth. When Earth Goat meets Water, it is like the Goat swimming in Water. So some difficulties can be expected. Since this is only the Year of birth the analysis will focus mostly on how the Animal Sign will react to each other in this year. Rat (Water) is destroyed by Goat (Earth). Therefore, this year is not generally auspicious for the Rat. Furthermore, there is a Harm (zi-wei), which adds further friction. Good Relationship: between Rat, Dragon and Monkey. Career/Finance: There will be some financial lost particularly in the Autumn months. (Be extra careful of being cheated.) Finance will recover and there will be some positive career achievement. Must be prepared for the worst as obstacles will hinder you. Romance/Love: High chance for Romance because of Zi Romance Star. The Rat will be looking for love and emotional support. There will be plenty of such encounters thought it might not last long. Most encounters will result in friendship. Health: No major health issues identified. Ox (Earth) is same with Goat (Earth). Since both elements are Earth, there are high indications of conflicts / competitions. Therefore, this year will provide some mix-blessing for the Ox. Furthermore, there is a Clash (chou-wei), which adds further problem which makes it a bad year for the Ox. Good Relationship: between Ox, Snake and Rooster. Career/Finance: Must beware of loss of wealth, so must take extra precaution in whatever you do in your business or financial management. Particularly, take extra caution in not offending your friends or colleague which might spread rumors to harm your promotion possibilities. Also, avoid any financial speculation during this year. You must be determined to overcome all your difficulties. Romance/Love: Nothing really fantastic about the romance of the Ox. Also, it is not a good time to plan for long term commitments. Health: There might be problems such as backaches or dizzy spells. So take extra care of yourself. Tiger (Wood) destroys Goat (Earth - Wealth). Since, Wealth can only be controlled by a Strong Wood. Therefore, this year will provide some mix-blessing for the Tiger. But generally more good than bad influence. However, you will be spending lots of time engaged in solving the various problems ahead. Good Relationship: between Tiger, Horse and Dog. Career/Finance: There is a good prospect for promotion or pay rise or increase in status. Must be careful not to make deisions which might cause you to lose these career opportunities. Success will result in the Ox over stressing itself. So must learn to relax (ie. go for a vacation) to avoid some unnecessary errors. Romance/Love: Will meet someone you like, but not advisable to commit yourself to marriage too quickly. Health: Some respiratory problems so take extra caution. Rabbit (Wood) destroys Goat (Earth - Wealth). Since, Wealth can only be controlled by a Strong Wood. Therefore, this year will provide some mix-blessing for the Rabbit. However, because Rabbit has a good affinity with Goat all difficulties will be easily resolved. Must be practical and pay attention in whatever you do. Do not take things for granted and Rabbit should enjoy a good year. Career/Finance: Rabbit can expect some unexpected windfall (lottery etc). There are good career opporunities with lots of self enhancement (study prospects) to increase your value to your company. Rabbit tends to take action rather than talk so is highly valued by your company. Romance/Love: There will be good relationship or existing relationhip will blossom. But never let your heart rule otherwise you might suffer. Health: No major health issue identified. Dragon (Earth) is same with Goat (Earth). Since both elements are Earth, there are high indications of conflicts / competitions. Therefore, this year will provide some mix-blessing for the Dragon. There is most likely stumbling blocks in whatever you do (ie things will not go smoothly). Good Relationship: between Dragon, Monkey and Rat. Career/Finance: Due to competition, expect some financial lost. Also your finance and career will not always be smooth sailing. There will also be gossips which might impact your reputation. Dragon will find lack of cooperation from your friends. Romance/Love: Complicated romance or have difficulty satisfying your spouse affection or needs. So must put in more effort. Also avoid letting your heart rule. Health: Dragon tends to have lots of accident in the year of the Goat, so be careful. Good Relationship: between Snake, Rooster, Ox. Career/Finance: Snake can expect promotions and pay rise. However, be prepared to receive lots of pressure. Try to take advantage of this good period to make influencial friends. Good for Profitable Investment. Romance/Love: It will be a busy year for romance, but will not lead to marriage. Must learn to improve your family relationship in this year. Health: Depression might be a problem if you put too much presure on yourself. Horse (Fire) produces Goat (Earth). Since it helps the Goat, you can expect a good year for the Horse. Good Relationship: between Horse, Dog, Tiger. Career/Finance: Horse will expect some windfall (ie lottery or bonus). Horse use it strong determination to help him succeed in his career. There will be possible change in career or change of residence (maybe even overseas). Horse will be luck to have friends to come to his aid. Romance/Love: Must beware of third party breaking up your relationship. Health: Must have sufficent rest and not overwork yourself. Horse tends to like to overwork. Goat (Earth) is same with Goat (Earth). Since both elements are Earth Goat, there are high indications of conflicts / competitions. Therefore, this year will not likely be a good year for the Goat. So you must be ready for some setback. Good Relationship: between Goat, Pig and Rabbit. Career/Finance: You will face lots of competitions. Though, you will receive lots of invitation, but you have to be careful. There is possible loss of wealth especially if you let your heart decide (ie. be careful of lending money to friends). You will need lots of determination to overcome difficulties. Never let your guard down. Health: Watch out for accidents. Monkey (Metal) is produced by Goat (Earth). Since Earth is favourable for Metal, we can expect some good year for the Monkey. Good Relationship: between Monkey, Rat and Dragon. Career/Finance: People tend to take advantage of the Monkey. Must refrain from saying too much to avoid creating disharmony or offending others. Must beware of money lost in business and for any betrayal in trust. Romance/Love: Need to spend extra effort in relationship. Should not have any long term commitments. Health: No major health issues, though there are some slight headaches and restlessness. Rooster (Metal) is produced by Goat (Earth). Since Earth is favourable for Metal, we can expect some good year for the Rooster. Good Relationship: between Rooster, Ox and Snake. Career/Finance: Must be careful and exercise caution otherwise might have loss of wealth. Expect to face some difficulties and will need some help from others to resolve your problem. Romance/Love: Average and quiet with some occational disagrements. Should improve relationship with your family members and learn to relax yourself. Dog (Earth) is same with Goat (Earth). Since both elements are Earth, there are high indications of conflicts / competitions. Therefore, this year will provide some mix-blessing for the Dragon. There is most likely stumbling blocks in whatever you do (ie things will not go smoothly). But generally still a good year for the Dog, if you remain patient and use logic to overcome your difficulties. Good Relationship: between Dog, Tiger and Horse. Career/Finance: Dog will have very good career and money prospect. Good for Investment. But must beware of lending money to others. Romance/Love: Is likely to find a good partner. Health: Must be careful of being too heaty. Pig (Water) is destroyed by Goat (Earth). Therefore, this year is not generally auspicious for the Pig. However, because of the affinity with Goat, Pig will enjoy a good year. Career/Finance: Pig will enjoy a good career. Promotion is expected, while business should expand. Should spend lots of time to improve your knowledge and career re-training. Pigs will find lots of new opportunity. Romance/Love: Must be care in your relationship otherwise third party might cause relationship problems. Should try to spend more time with your family. Health: Must take care especially in digestive or stomach.